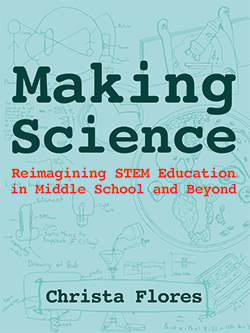 Making Science: Reimagining STEM Education in Middle School and Beyond is a new look at STEM education for the modern world. Steeped in research and history, but as modern as a trip to Mars, this book will make you think deeply about the nature of science and science learning. Richly illustrated with examples of student work, this book offers project ideas, connections to the new Next Generation Science Standards, assessment strategies, and practical tips for educators. Anthropologist turned science and making teacher Christa Flores shares her classroom tested lessons and resources for learning-by-making in the middle grades and beyond. Take a journey through science that explores how to make classrooms more engaging, inclusive, and reflective of real science from the world. Imaginative, lyrical, and astonishing lessons come to life as Christa unfolds her Problem-based Science curriculum for the middle years. For many students, middle school is a time when science turns boring, as wonder turns to worksheets and dull experiments. Making Science: Reimagining STEM Education in Middle School and Beyond is about combining new technology from the maker movement, real world materials and a designer mindset to create personalized learning experiences that engage students in the wonder of science. Christa explores how to build science literacy that empowers students to become informed and engaged citizens and global problem-solvers. The book also includes “Case Stories” from a diverse group of elementary, middle, and high school science classrooms, plus informal and individual learning environments. These stories showcase how to use real science, digital fabrication, making, and design as a way to engage today’s youth. Making Science: Reimagining STEM Education in Middle School and Beyond celebrates STEM and STEAM for every student, including those traditionally underserved in STEM education. MSRP $19.95 (Print paperback) $7.99 (Kindle ebook) Get the Kindle edition for free when you purchase the paperback book from Amazon.com through their “Matchbook” program. Christa Flores has taught lab-based science for 10 years in K-8 classrooms. Christa graduated from the University of California San Diego with a degree in Biological Anthropology, has done graduate level work in primatology research through the New York Consortium of Evolutionary Primatology and obtained a masters in Secondary Science Education from Teachers College, Columbia University. She is also a Columbia University FabLearn Fellow evangelizing making in education with a focus on how to assess student learning in a maker classroom. She is passionate about making, and researching and designing meaningful making experiences for children in formal and informal learning environments. Making Science: Reimagining STEM Education in Middle School and Beyond is available from Amazon.com, Barnes&Noble, and major online retailers. Contact us – For volume sales, PO purchases, or international sales, contact CMK Press. This book is available from local distributors in the U.S, Australia, and the U.K.